What does that do? Well, In UNIX, .. means parent directory of the current directory, so in this case, I’m creating a file named file1 and placing it 2 folders up from the current directory. 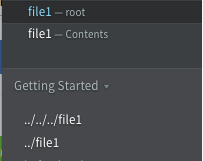 In Thimble, this is somewhat safe to do (Since file/folder structures are stored locally) but this is still a bug that could potentially lead to unwanted actions. Because Thimble is a fork of Adobe Brackets, it would be best to fix this issue in Brackets rather than on Thimble. Why? Because if any other projects are forked from Brackets (Like Thimble), it’s safe to assume they will also have this bug in it. Fixing it in Brackets ensures that other forks will eventually inherit the fix. My second bug is more of a feature. At the current state, there’s no way for the end-user to download a single file or whole folder structure. Fixing these bugs shouldn’t take long. Hopefully.